My sister-in-law’s Saskatoon berry pie. Visiting Mom on the family farm over the past little while, thank goodness I walked. Daily. Because when you’re surrounded by women who can cook like this, there’s only one choice and that’s to roll in it and move. Often. 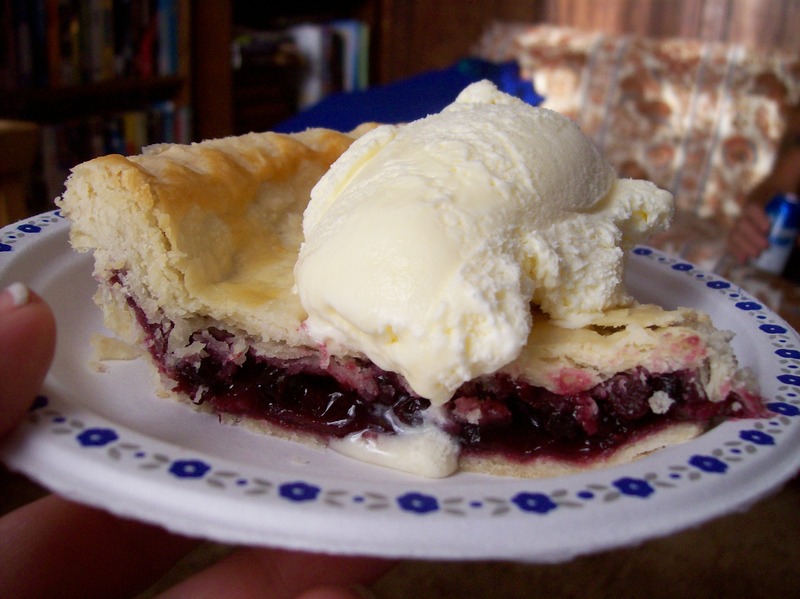 Saskatoon berries are tiny and naturally sweet; Saskatoon berry pie is juicy and delicious, like the glamorous Debutante a blueberry pie could only dream of being. I knew it’d be quite some time before I’d get another chance at this so, no, I did not pass it up. Which is why I added a new exercise program to my routine this week: the Couch-to-5K running plan. Inspired by the success of bloggers like Sandi who changed her life in a big way I downloaded the free pod casts to my mp3 player. Slick-as-what, this workout will get you sweating in a hurry. And that’s a bit of a necessity. If you like pie. Have you been tempted of late? Are you keeping in touch or keeping your distance? So, there I was, two weeks ago, boarding ticket in hand, bags packed and ready to go see my ailing Mom. The fridge was stocked, my guys had hugged me 2 million times and all there was left to do was to just get there already. Not really knowing what I was headed into, I can look back now and admit that I was a mess. The flying was uneventful but I sure wasn’t. Sitting in MSP airport I watched as a young girl interact with her grandmother… and silently I cried. Standing behind a woman buying soup, I watched her rest her hand on her daughter’s head and silently I cried. Working my way through customs, I did my best to stand purposefully and move the line along and when the Immigration Agent politely asked the purpose of my visit, silently, yep, I cried. You see, I just couldn’t say the words out loud and this was the big secret I carried: the fact that this trip felt different. This trip frightened me. I couldn’t acknowledge how this trip felt bigger than many of those that had come before it. So …. as most of us do … I held myself in check and choked out short answers like, “Just visiting family” to airport inquiries and prayed my watery eyes wouldn’t betray me. But when I got through customs and into the receiving area, I lost it. Spotting my other sister, the one I’m not as close to as I once was, I can only imagine now how much my sobs must have confused her. It’s been a long summer. There’s been a lot of uncertainty. A lot of “what ifs” and a too many miles separating me from the rest of them. But … so much of that melted away when I walked into my oldest sister’s home and spotted Mom comfortably ensconced in her sun room. Her face lifted and when those eyes met mine, the grins were undeniable and then, well … that’s when the tears came. After the hugs and the how-are-yous, we found ourselves settling into a new normal. I’ve never stayed anywhere but with her on the farm because there’s an unwritten rule that my time is always, always spent on her. Well, Mom was at Sissy’s and now, so was I. What I didn’t realize until I got there was the role I would take. Yes I knew I would comfort, cheer and engage but I soon found myself supporting my sister as she did the work to nurse Mom back to health. I found a spot at her sink, washing dishes and cleaning garden vegetables. I found myself folding towels and at her range, simmering soups and whipping up favorite icings. I found myself up early with my brother-in-law, brewing coffee and crafting omelettes and doing everything I could think of to make it easy. I made myself available so Sissy could step away for a break, a shower, a moment. 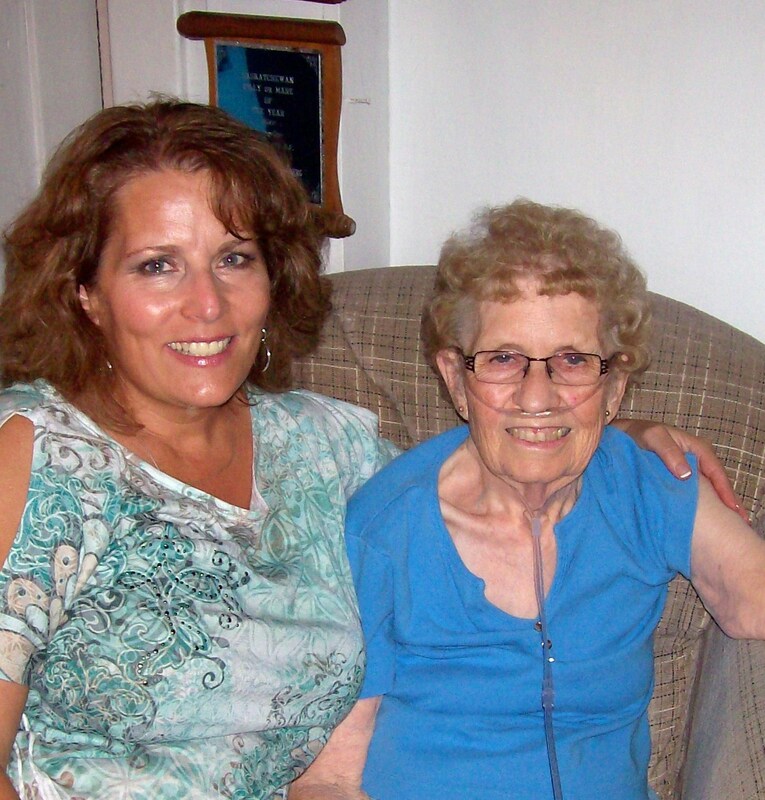 After several days we moved Mom back to her house and I saw a change in her that I hadn’t expected: I saw her at home, in her element, and back in control. I watched as she whipped her oxygen cord around like a lariat and laughed when I got myself caught in it. I delighted in the fact that it was her little face that I kissed good night and her sweet smile greeting me morning after morning. And when I caught myself standing at her sink washing vegetables or at her range simmering supper, I realized that I’d come home, too. It wasn’t just that I’d come home to the place I’d grown up — but that I’d come home to a role she’d taught me — one I’ve grown familiar with over the years: that of being useful, of having a purpose, of offering up my assistance with a heaping helping of good cheer peppered with absolutely no b.s. How about you? Have you ever “gone home” again only to find yourself in a different role than the one you’d expected? So, I haven’t shared much of this before now, but my Mom’s had some health issues this summer and is currently recouping at my sister’s. My sister, a nurse by trade and a caretaker by heart, has fluffed the pillows, simmered the soup and baked the bread. Mom’s snuggled, tucked and loved and if there is a place for her that’s better than sissy’s, I’d be hard pressed to tell you where it is. And, to the best of my ability, when Mom asks, I go. So with that, I’m prairie-bound this morning. I’ll try my best to help, to cheer, to comfort, and to engage. I’ll also take the opportunity to say the things I need to say. Because as hard as it is to get those words out, those are the one I think most need to be said. You know what I mean: expressions of emotion that dwell so close to our hearts that they pinch when we release them. And even though I’ll probably stumble my way through, I’m determined to step over my fears and say them anyways. And mostly? Mostly I aim to do for her what she’s done for me. I’m a list maker. Today’s is short: do a bit of laundry, pull some weeds, pop a roast in the oven and read. I came across this list a few days ago and thought it was perfect for a Sunday. 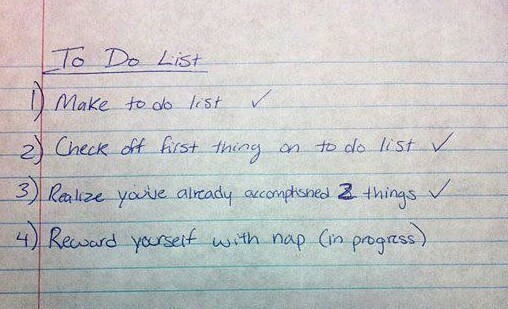 What do you hope to accomplish today? So there’s this salad I make that’s so yummy, so good, you really won’t believe it. You surely won’t believe what’s in it! It shouldn’t be called salad though…. it’s salad’s naughty cousin … the pasta salad. 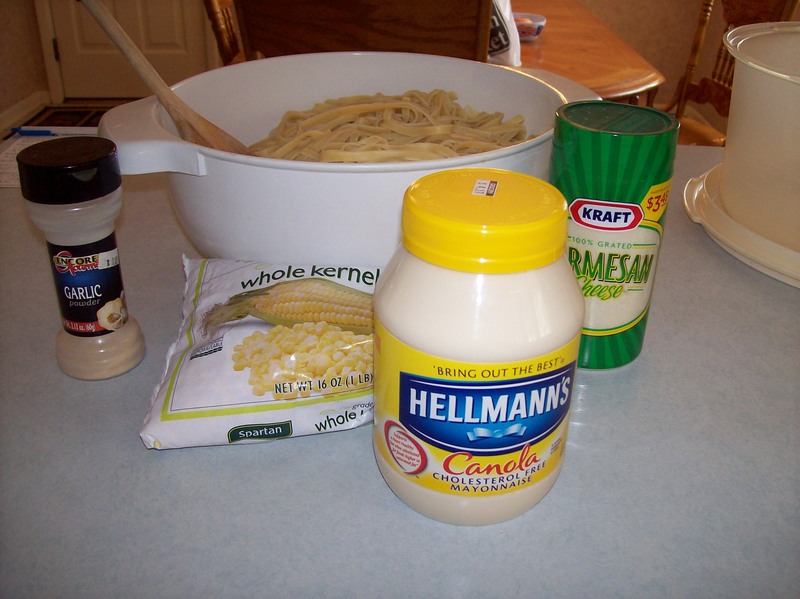 Rich and decadent, creamy and delicious, it’s my Alfredo Salad. My cousin just asked for the recipe and I shared it. Afterwards, it occurred to me to share it here with you fine folks as well. If you follow my directions, I promise it will turn out just fine. Boil noodles & let cool. Coat cooled noodles with enough mayo to coat but not drown the noodles. Toss liberally with Parmesan cheese, sprinkle in garlic seasoning to taste and add the corn last. P.S. Unless I’m baking, I don’t measure, I cook by “feel.” You will not use all of the mayo but you will use most of the parm. P.P. S.S. Great if made a day ahead but best if made and served the same day. I don’t know about you but I’ve got a fair amount of self-help books sitting around. I love to read and have always gravitated to topics that cause me to ponder life’s choices and think about what’s next. But, having said that, there’s a very distinct part of me that is so clearly my mother’s daughter: she, the feisty little narrator who lives inside my head and sports cat-eye glasses and pedal pushers. She snorts and nudges and whispers Balderdash!! whenever Oprah or some other guru-type starts telling me how we should be living. You know what I’m talking about: you’ve seen the excitement when “they” are on the precipice of something meaningful. And sometimes they truly have been. I don’t mean any disrespect but I’ve rolled my eyes more times than not when listening to her. See if I had O’s bazillions of dollars I’d probably have a monthly magazine with my fine self on it, too. I’d smile and cook with Paula Deen and get tips from Dr. Oz and give advice and tell other people how it’s done .. or not. Actually, it’s more likely that I’d set down the oven mitts and turn off the fans and look to the camera to say: You know more than you think you do so when that inner voice that we all have picks at you and pulls you back from doing what others think you should, stifle yourself and listen. How about you? Do you trust your instincts and heed your own advice? I’ve been pondering on all that we learn about life via the wonderful world of business, especially as I watch our youngest navigate college course selections for his fall semester. He has no idea what he wants to do, career-wise (who does at 18?). He’s venturing in slowly, taking a few classes and working. And I’m fine with that. If it takes him longer, so be it. I don’t care. I’d rather he wade in and embrace the current on his legs than jump off the deep end and drown. We were discussing different class choices today and one that jumped out at me was “Business ethics.” This course focuses on office culture, confidentiality, diversity, communications etiquette, dining etiquette, dress code and sexual harassment. Wow, how could I have benefited from such a course in my tender years. You see, like most of us, I took the usual “pre requisites” and later, coursework that was specific to my degree. I could have used a class that taught me what to do when someone put me down, discounted my input, or stared at my chest too long. I could have used the practice to learn how to deal with men who leered and women who back-stabbed. But, like most of us, that wasn’t an option. I learned the hard way. 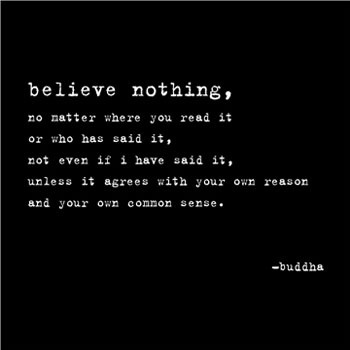 I learned to laugh off someone’s stupid comments and leering eyes. I learned, over time, to speak up and make it clear when their jokes weren’t funny. I think back to when I was working as an executive administrator for a global corporation. Most employees were well-behaved, polite and extremely dedicated. But there were always those few executives, all men, who took their positions of power just a bit too far. They enjoyed their status and expected others to grovel. Many did. I wouldn’t. There was the aged goat who spoke condescendingly to us about “never fishing off the company dock” and then went on to marry his secretary, 25 years his junior, 3 months later. I recall the time that one suggested that all we (admin staff) were good for was “prettying up the outer offices and making sure their homes were managed.” My gasp gave me away. I remember his beady eyes boring down on me and feeling the dread that washed over me like a summer’s rain. He turned and, in front of a room full of colleagues, asked, “Did you have something to add?” And I did. I unleashed a hornet’s nest of commentary, spewing years of pent-up frustration at that greasy little twerp. I related what it felt like to be discounted and how rude it was of him and his cronies to treat us all like second class citizens. I wish I could tell you everything I said, but I can’t. What I do remember is that others in the room faded from my vision as my focus became his sweaty face. I watched him chew his bottom lip as the color drained from his cheeks and his knuckles gripped the table. Unlike a Julia Roberts movie, it was not my finest moment. There was no applause, only stunned silence as I made a quick exit. Oh I was mad and, some might say, justifiably so. But, in the process, I lost control and ultimately … I lost ground. It was an important life lesson: I had to learn how to be heard without losing myself along the way. He never heard a word I said and, looking back, I can’t say I’m surprised. And I learned from it. And you? Have you ever lost your cool in a corporate environment? What did you learn from it?